Here are some facts about the River Cam. The River Cam flows from the university city of Cambridge, to the Great Ouse River, near Ely. It is about 64 km long and the entire river is navigable. Clare College Bridge is the oldest of over 20 bridges across the Cam in Cambridge. Part of the decoration was never completed; one story tells that the builder felt he wasn’t paid enough. One of the most famous bridges over the Cam is the Mathematical Bridge at Queens’ College. The wooden bridge was built in 1749 of straight timbers and is unusually strong. The covered Bridge of Sighs at St. John’s College is another famous Cambridge bridge. It may have been given its name from students sighing as they walked across it on their way to take their exams. Punting is a popular pastime with students and tourists on the River Cam. Scudamore’s is the oldest punting company in Cambridge, and has been in business since 1910. The Conservators of the River Cam was founded in 1702, to oversee navigation on the river. 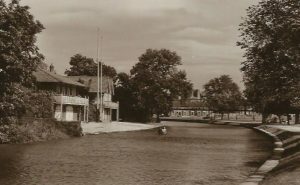 The headquarters at Clayhithe can still be seen, but today navigation is handled by the Environment Agency. The water level in the River Cam is carefully controlled by several locks and weirs. The Environment Agency is responsible for the water level, and for issuing flood warnings. The River Cam flooded in 2001 and again in 2009. In October, 2001 over 80 mm of rain fell on the city of Cambridge in a single day. 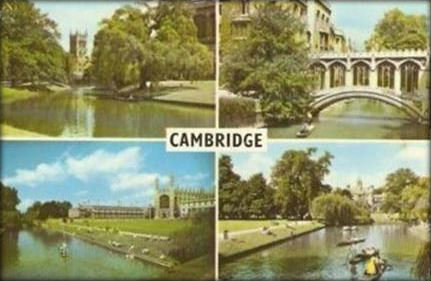 Several colleges in Cambridge back on to the river – an area known as the Backs. At one time, the land was used for growing fruit or raising cattle and sheep. The River Cam may be home to the burbot, a species of fish often thought to be extinct. Fishing is not popular on the Cam as the water is generally too clear.